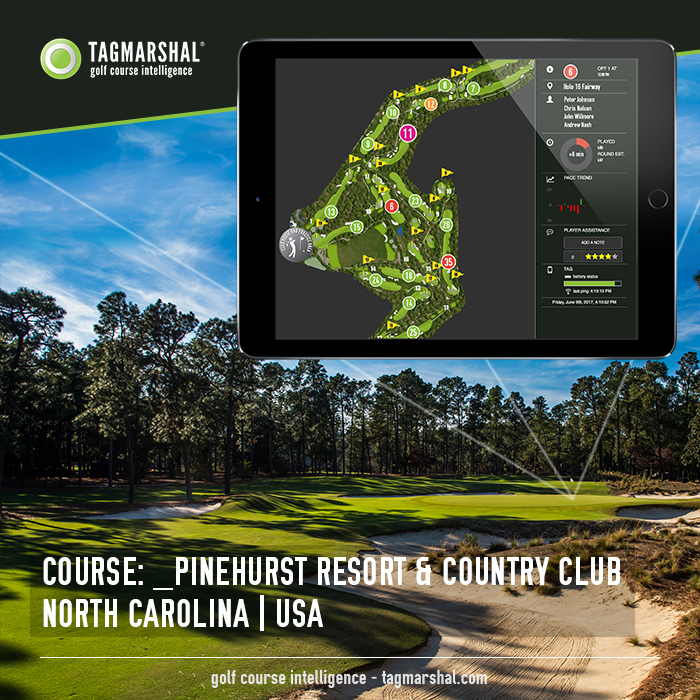 (PINEHURST, N.C.) – Tagmarshal – the golf course intelligence and pace-of-play system used by golf courses, country clubs and resorts globally – is operational at Pinehurst Resort & Country Club, host of the 2019 U.S. Amateur Championship and one of Golf Digest’s top-five courses worldwide. 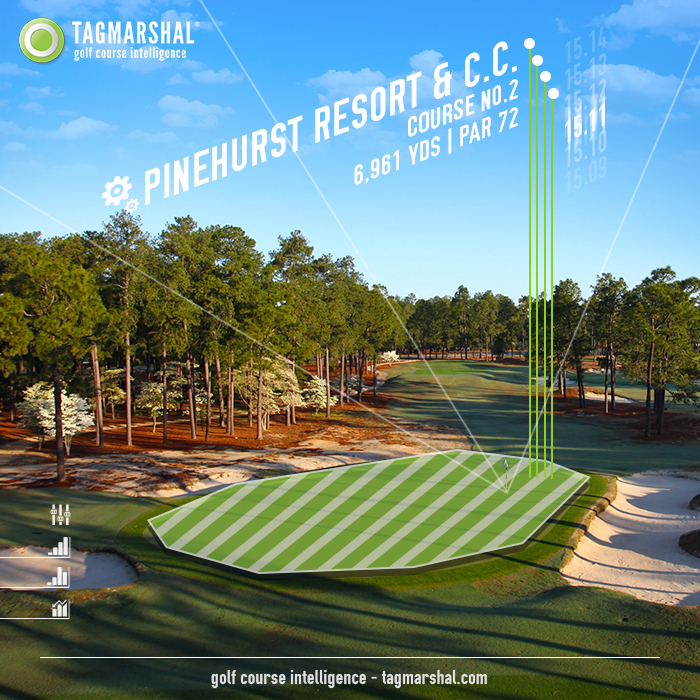 With more single golf championships than any other site in America and home to nine challenging golf courses, Pinehurst will enhance its already renowned player experience and increase operational efficiencies by using Tagmarshal’s sophisticated geo-tagging and pace algorithm software. Equipped with vital statistics, some courses will expect to see a 15-17 minute decrease for each round and increased maintenance efficiency due to the use of heat mapping. Recent installments of the system across the country have created 70 percent of rounds being played on pace or within five minutes of target goal times. Top-ranked courses trusting Tagmarshal include Carnoustie Golf (The 2018 Open Championship), The Ocean Course at Kiawah Island Golf Resort (2021 PGA Championship), Whistling Straits (2020 Ryder Cup), Erin Hills (2017 U.S. Open), East Lake (2017 TOUR Championship), Valhalla (PGA Championship 2014), and more. Partnering with Tagmarshal positions courses as industry leaders, giving them proven operational efficiencies, while superintendents use Tagmarshal data to better manage pin placements, wear patterns and hole set-ups. Located in the sandhills of North Carolina, Pinehurst Resort & Country Club, established in 1895, is a 2,000-acre property featuring an award-winning spa, nine golf courses, tennis, and activities for the family. Widely known as the Cradle of American Golf, Pinehurst has hosted more single golf championships than any other site in America, including the U.S. Open, U.S. Women’s Open, PGA Championship, the Ryder Cup, PGA TOUR Championship and many others. In 2024, it will again serve as the site for the U.S. Open. Tagmarshal is a golf course intelligence and pace-of-play management solution that turns pace into an asset. The system uses small “tags” clipped onto golf bags or installed on carts which transmit geo-location data. Industry-leading algorithms identify risk groups with accurate, objective support to alleviate pace challenges before they arise. Public, private and resort courses using Tagmarshal realize substantial returns on investments through improved on-course experiences achieved with less staff as well as increases in daily rounds. Impactful and easy-to-use data analytics, weather data integration and geo-fencing complete the offering. New Feature Release: User Management and Notification Portal. Boosting the bottom line.